India won the One Day International series with four games to New Zealand’s one. The visitors had already won after the third ODI with 3 – 1. New Zealand had an excellent win in the fourth match, while India won the fifth match. 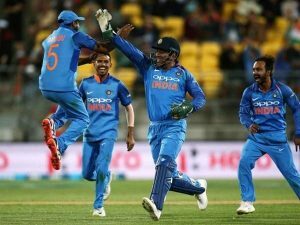 Apart from the fourth match in Hamilton, India played well in the ODI tournament against New Zealand. The team celebrated the win with the trophy in hand. Man of the Series went to Mohammed Shami. Shami bowled outstandingly, taking nine wickets in the series. His bowling was vital in India’s successful series win. Ambati Rayudu took Man of the match in the final ODI. Rayudu essentially carried India to a win in the fifth ODI with 90 runs. This includes four sixes and eight fours. Vijay Shankar and Hardik Pandya both helped India reach their run total with 45 runs each. Kedar Jadhav made 24 runs. India won the toss, choosing to bat first. The final score showed India with 252 runs in 49.5 overs, and New Zealand with 217 runs in 44.1 overs. India still has a three-match T20 International series in New Zealand. The first T20 takes place on 6th February, with the next two matches on the 8th and 10th February. The Indian team has been away from home for quite some time, and return home after their New Zealand tour. Although India came to New Zealand from an Australian tour, the team will meet Australia again. This time the teams play in India. The short Australian tour of India includes two T20I matches towards the end of February, and five ODIs in March. Next up in international cricket is the ICC Cricket World Cup. India’s first warmup match is on 25th May 2019.